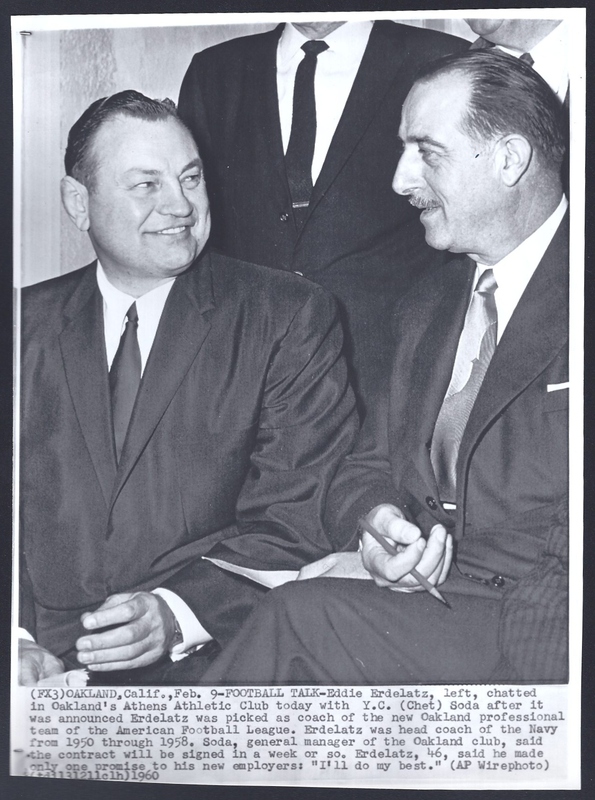 February 9, 1960 – Oakland Raiders Hire Head Coach! The 1960 Fleer set is one of the more interesting football card sets produced in the 60s. Fleer made its initial foray into football cards with a set dedicated to the fledgling American Football League. Unlike their earlier baseball sets, the Fleer football issue was not a collection of cards representing long-retired athletes, but rather focused on current “athletes.” Unfortunately their efforts to recognize the men of “the other league” met with problems that today make the set look like half-baked effort on Fleer’s part. The term “quality control” does not appear to have been part of the Fleer lexicon back then. Grab a handful of 1960 Fleer cards and you will likely come up with very few that would be considered acceptable by today’s hobby standards. Rough cuts, diamond cuts, off-centering, poor registry and numerous other printing flaws were rampant in this set, making a truly near-mint set incredibly difficult to build today. The other main flaw with this set, at least in my humble opinion, is that the set was released very early in the 1960 football preseason. With the AFL teams scrambling to fill their rosters for the league’s first season, players were being signed, waived, traded and re-signed at a furious pace – so much so that nearly a full-third of the 132 card-set features players that never made a final AFL roster and subsequently never played in an AFL game. 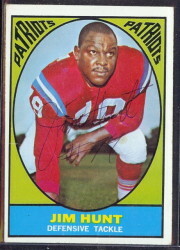 While legendary players like Abner Haynes, George Blanda, Ron Mix and Jack Kemp all have cards in the 1960 Fleer set, so do men like George Blanch, J.W. Slack, Stan Flowers and Sam McCord – none of whom ever played in an AFL game. However, Fleer did do at least one thing for which I am particularly grateful; they produced cards for the head coaches of each of the AFL teams… well, almost. For some unknown reason, there is no card for the Denver Broncos head coach, Frank Filchock. This seven-card subset represents the only regular-issue cards printed for head coaches during the entire 10-year existence of the AFL. It is truly a special group of cards, featuring a notable cast of AFL characters. 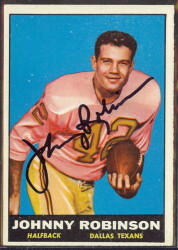 So without further adieu, and listed in order of their card numbers so as not to show any unjust favoritism (though the Gillman card was the first autographed AFL card in my collection), the head coaches of the American Football League – 1960, sadly, sans Frank Filchock. 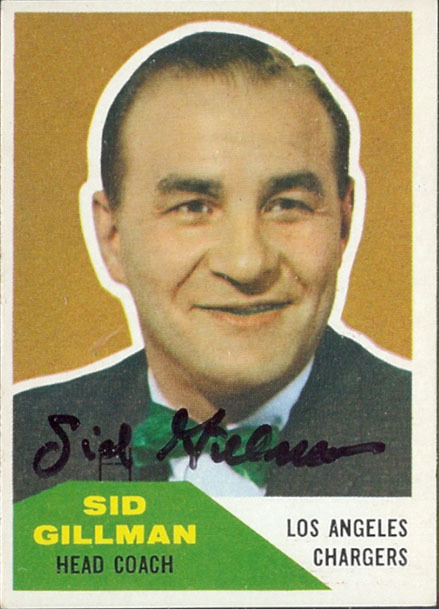 Second only to Hank Stram in the number games coached during the AFL, Sid Gillman was the head coach and general manager of the Chargers from 1960 through the ninth game of the 1969 season, when health reasons forced his temporary absence from the sidelines. Gillman was a legendary innovator who can take credit with popularizing film study as a coaching tool, hiring the first strength coach in professional football and designing offensive theory that is still being used in the NFL today. He was inducted into the Pro Football Hall of Fame in 1983, and was still reviewing weekly game film for several NFL teams well into his 80s. 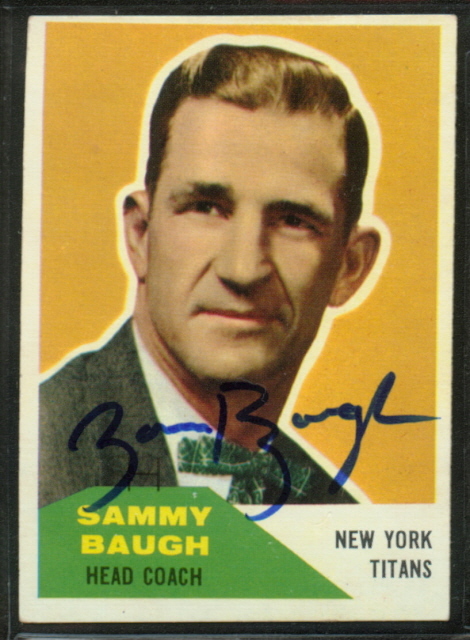 Sammy Baugh had long ago retired from a hall of fame playing career when he grudgingly left his Texas ranch to coach the New York Titans. For Baugh, life in the Big Apple was made exceptionally crazy by the Titans’ owner, the loud, boisterous and chronically under-funded Harry Wismer. In addition to dealing with all of the issues inherent to starting a new team in a new league, Baugh had to contend with Wismer, whose paychecks bounced so frequently that the players made a mad-dash to the bank the moment they were issued, knowing that the account only had enough money to cover the first few paychecks to be redeemed. 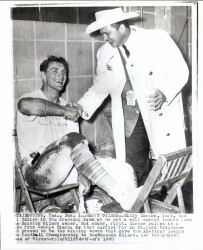 Baugh left the Titans after the 1961 season, returning to his ranch in Rotan, Texas. 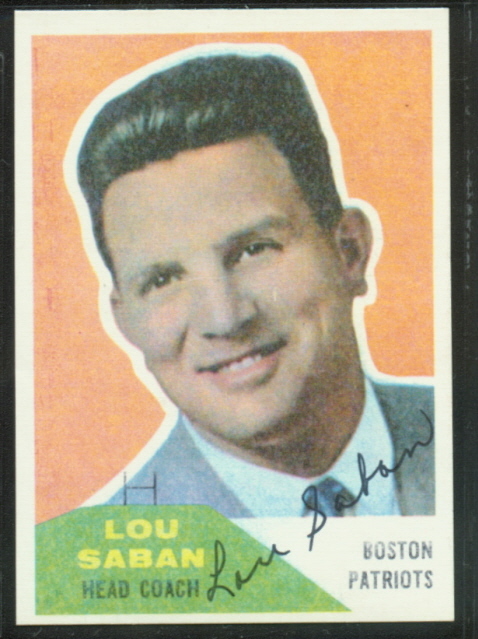 Lou Saban began his AFL affiliation as head coach of the Boston Patriots (1960-1961), but he also held the head post with the Buffalo Bills (1962–1965, 1972–1976), and Denver Broncos (1967–1971). Though his tenure with the Patriots was short-lived and barely featured more wins than losses (14-13-1), Saban won back-to-back AFL championships with the Buffalo Bills in 1964 & 1965. A man who seemed constantly on the move, Saban’s coaching career spanned from 1950-2002, and included many stops in college and professional football. At the time of his death (March 29, 2009), Saban was the last surviving head coach of the original eight American Football League franchises. 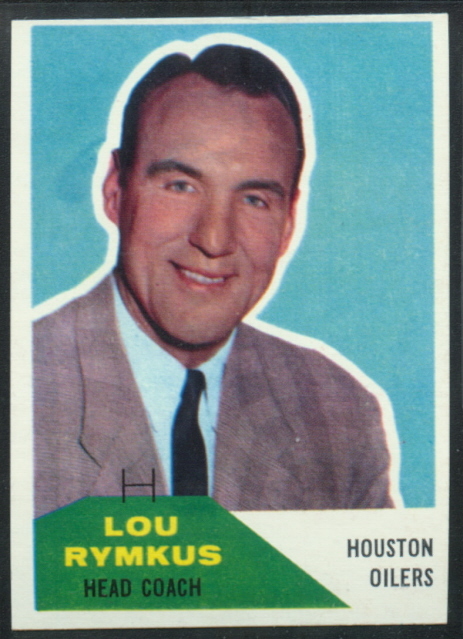 A former player under the legendary Paul Brown, Lou Rymkus, led the Houston Oilers to an AFL championship in 1960. 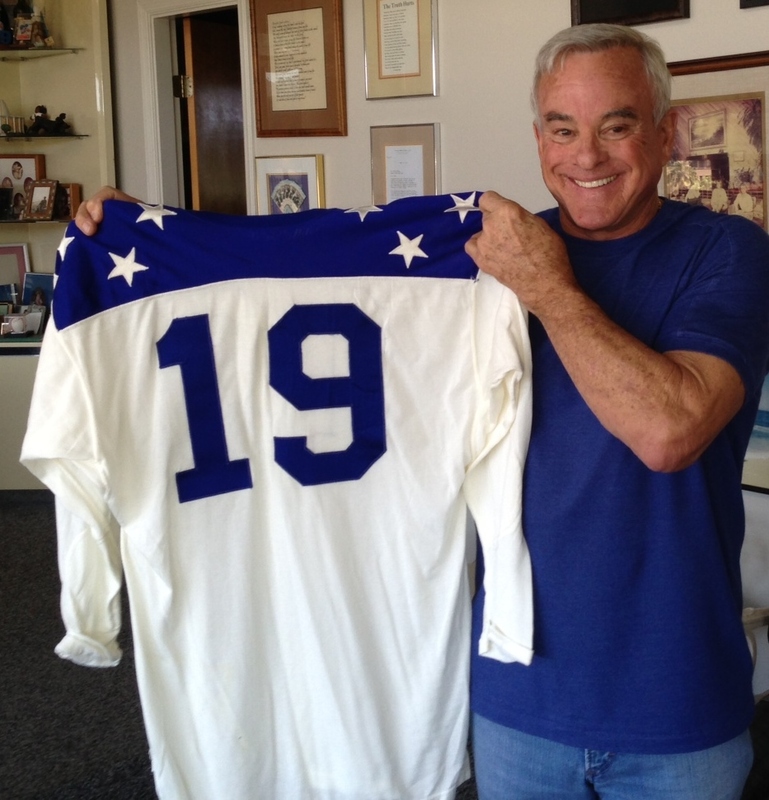 The championship provided Rymkus with an extra degree of satisfaction because it came over a Chargers team coached by his arch-nemesis, Sid Gillman. No one is exactly sure how the feud began, but it stemmed from the days when Rymkus was an assistant coach on Gillman’s Los Angeles Rams team. The two nearly came to blows one day in 1959, and despised each other since. Despite the 1960 championship, the team’s slow start in 1961 and Rymkus’ outspoken criticism of the Oilers’ owner, Bud Adams, resulted in his dismissal as head coach early in the 1961 season. Buster Ramsey was a mountain man from Tennessee who worked hard, played hard, and loved his backwoods moonshine. An alumnus of the College of William and Mary, Ramsey excelled as a defensive player and coach for the Detroit Lions in the 1950s. 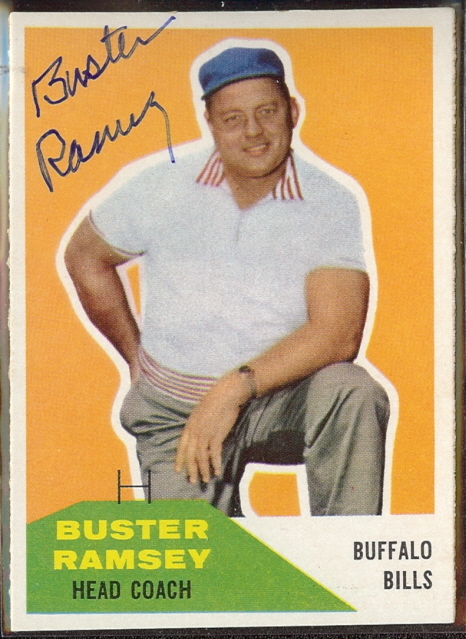 When he took over the Bills in 1960, he instantly won the loyalty of his players. Said Bills’ offensive lineman, Al Bemiller, in Jeff Miller’s AFL classic, Going Long, “I loved the man. I knew exactly where I stood with him. He had an old gimpy leg, but many times, he’d get down in the trenches himself and make you block him.” Nattily-dressed and bubbling-over with enthusiasm, Hank Stram roamed the Dallas Texans & Kansas City Chiefs sidelines as head coach from the 1960 preseason through the final game of 1974. Stram coached Hall of Famers Len Dawson, Bobby Bell, Buck Buchanan, Willie Lanier, Jan Stenerud and many others that deserve to be in the Hall, like Johnny Robinson, Ed Budde and Otis Taylor. 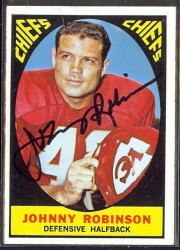 Stram, who coached the Chiefs to victory over the Minnesota Vikings in Super Bowl IV, was inducted into the Pro Football Hall of Fame in 2003. Eddie Erdelatz was a successful collegiate coach, who turned a moribund Naval Academy team into a respectable football program. He had been out of football for a little more than a year when he accepted the Raiders offer to become the first head coach in franchise history. 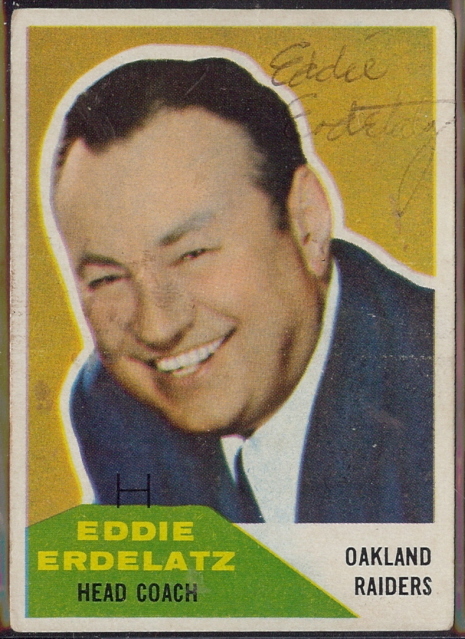 Erdelatz led a weak Raiders’ team to a 6-8 record for the 1960 season. However when Oakland was outscored 99-0 in the first two games of 1961, Erdelatz was relieved of his duties. He was working outside of football in 1966, when he had surgery to remove a cancerous tumor in his stomach, and died two weeks later.